I am currently assigned to Marsh Avenue Expeditionary Learning. I was originally working as a STEM teacher at IS 49.
baby boomer retirements deplete the science and technology workforce by 50 percent over the next decade. Here are some fun ways to learn about Engineering, Design and other STEM apps. Education and Virtual Reality – Where we’re going. For over two decades virtual reality took a break. Now it’s back and the huge headsets and gloves have been replaced by smaller, lighter ones and work with your smartphone. What does that mean for education? Well, actually a lot. From virtual field trips to virtual science experiments, classrooms are going to be immersed in educational content. Low cost headsets can be found for as little as $20. The mobile devices are another thing. Some have said to partner up with companies that collect old phones and see if they would donate to your school. Where Education is Going with Virtual Reality. from Mr. Portelos on Vimeo. 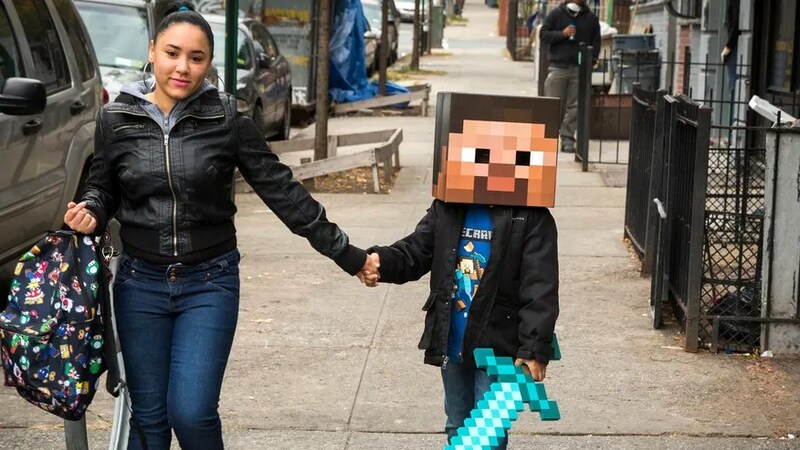 A woman walks her child to school as he is dressed as a character from Minecraft in New York October 31, 2014. America has a problem: Not enough U.S. students are pursuing engineering careers. That troubling fact helps explain why there are currently millions of vacant jobs across our nation, even as the number of Americans not in the labor force is the highest it’s ever been. There simply are not enough applicants with adequate skills to fill many of the most promising positions available in the 21st century. This lack of skills is especially acute in jobs that increasingly rely on science, technology, engineering, and math. This set of circumstances is worrisome for science-based companies like ExxonMobil, of course. But more broadly it is troubling for America’s future competitiveness in the global economy. To help address this predicament, ExxonMobil has launched a nationwide initiative seeking to inspire the next generation of engineers. OurBe an Engineer campaign aims to highlight the meaningful contributions that engineers make to the world, as well as provide resources to assist young people interested in pursuing the profession. In the weeks and months ahead we’ll be running a number of commercials on television in support of this effort. You cancatch them at ExxonMobil’s YouTube channelas well. Over the next few weeks I will occasionally turn this space over to guest bloggers who will share their experiences as engineers and why engineering can make for a rewarding and valuable career. Among them is Dan Mote, longtime educator and currently the president of the National Academy of Engineering. Today, though, I want to share with you a few thoughts on the state of engineering in America offered by our Chairman and CEO, Rex Tillerson. Engineers are the marriage of science and mathematics. We take those two things, we put them together and we create everything around us, from your iPad to this building we’re sitting in to the medium that we’re broadcasting to people today to the houses we live in to the cars we drive. They are all engineering products. I am confident that the more that young people actually learn what engineers do and accomplish for society, the more they will be drawn to pursuing careers in that direction. Have your monitor use less energy using this website. I’m really happy that my article was published in the NY Teacher newspaper!! !